Hepatitis A is a form of viral hepatitis also known as infectious hepatitis, due to its ability to be spread through personal contact. Hepatitis A is a milder liver disease than hepatitis B , and asymptomatic infections are very common, especially in children. Hepatitis A does not cause a carrier state or chronic liver disease. Once the infection ends, there is no lasting phase of illness. However, it is not uncommon to have a second episode of symptoms about a month after the first; this is called a relapse. Hepatitis A has a worldwide distribution and is endemic in most countries. However, the incidence of the disease is declining in developed countries. There is a very high incidence in developing countries and rural areas. For example, in rural areas of South Africa, the rate of infection is 100 percent. According to the Centers for Disease Control, HAV infects up to 200,000 Americans each year with the highest rate of hepatitis A being among children five to 14 years of age. Almost 30 percent of reported cases of hepatitis A occur among children under 15 years of age, chiefly because they are frequently in close contact with other children in school and at daycare. Approximately 15 percent of reported cases of hepatitis A occur among children or employees in daycare centers. The states with the highest incidence of hepatitis A account for 50 percent of the reported cases. According to the American Academy of Pediatrics, 11 states have a rate of HAV infection that is at least twice the national average, or 20 cases per every 100,000 people. The states are: Arizona, Alaska, California, Idaho, Nevada, New Mexico, Oklahoma, Oregon, South Dakota, Utah, and Washington. Hepatitis A is caused by HAV, also called Entero-virus 72 , which was identified in 1973. The virus has an incubation period of three to five weeks. It enters the body via the gut and replicates in the digestive tract and spreads to infect the liver, where it multiplies. HAV is excreted in the stools for two weeks preceding the onset of symptoms. Persons with hepatitis A may not have signs or symptoms of the disease and older persons are more likely to have symptoms than children. If present, symptoms are non-specific and usually include fever , tiredness, loss of appetite, nausea , abdominal discomfort, dark urine, and jaundice (yellowing of the skin and eyes). Symptoms usually last less than two months, but some persons can be ill for as long as six months. A child's skikn is yellow in color. Hepatitis A symptoms often go unrecognized because they are not specific to hepatitis A, thus a blood test (IgM anti-HAV) is required to diagnose HAV infection. This test detects a specific antibody, called hepatitis A IgM, that develops when HAV is present in the body. Fluids and diet. The best treatment is to make sure that the child drinks a lot of fluids and eats well. Medications. The body's immune system fights the HAV infection. Once the child recovers from hepatitis A, the virus leaves the body. Medications, prescription or nonprescription, should not be given without consulting the doctor. Parents should ensure that their infected child has a well-balanced diet. Children with advanced liver disease need to follow specific diets issued by the treating physician. However, most children are not in this category, and no special diet is currently recommended for them, except that they should avoid eating fatty foods because the body has difficulty digesting fat when the liver is not working well. However, adequate protein intake is important to regenerate liver cells. Children without liver cirrhosis require about 2–3 grams of protein per kilogram of body weight. Children with cirrhosis need an individual nutrition plan from their pediatric specialist or nutritionist. 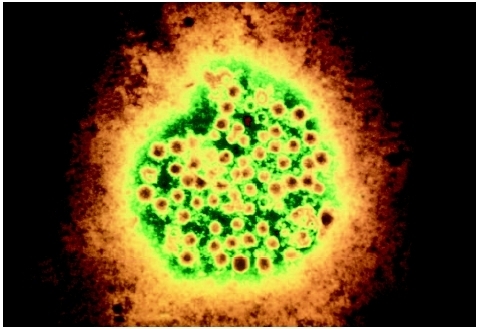 Hepatitis A virus magnified 225,000 times. Viral hepatitis symptoms usually last three weeks to two months but may last up to six months. Children may return to daycare one week after symptoms first appear, with the doctor's permission. Most children with hepatitis get better naturally without liver problems later in life. However, some children do have subsequent liver problems. For this reason, it is important to keep in close touch with the treating physician and to keep all followup appointments. Chronic, or relapsing, infection does not occur with hepatitis A. In the United States, serious complications are infrequent, and deaths are very rare. According to the Centers for Disease Control and Prevention (CDC), routine vaccination of children is the most effective way to lower the incidence of hepatitis A nationwide. The CDC encourages implementation of routine hepatitis A vaccination programs for children in the 17 states which have the highest rates of hepatitis A. Hepatitis A vaccine has been licensed in the United States for use in persons two years of age and older. The vaccine is recommended (before exposure to hepatitis A virus) for persons who are more likely to get hepatitis A virus infection or are more likely to get seriously ill if they do get hepatitis A. The vaccines licensed in the United States as of 2004 were HAVRIX(r) (manufactured by Glaxo SmithKline) and VAQTA(r) (manufactured by Merck & Co., Inc). Parents should teach their children always to wash their hands with soap and water after using the bathroom and before preparing and eating food. Travelers should avoid water and ice if unsure of their purity, or they can boil water for one minute before drinking it. Short-term protection against hepatitis A is available from immune globulin, a preparation of antibodies that can be given before exposure for short-term protection against hepatitis A and for persons who have already been exposed to HAV. It can be given before and within two weeks after suspected contact with the virus. The best way to prevent exposure to HAV is good habits in washing hands. Children should wash their hands every time they go to the bathroom. Good handwashing should be enforced at home and at daycare facilities. It is also very important to keep a clean environment, such as clean toilets, bathrooms, and clothing. If a child is diagnosed with HAV, other family members should be treated to prevent spread of the disease. The healthcare provider can help parents to plan treatment for the entire family. Hepatitis A —Commonly called infectious hepatitis, caused by the hepatitis A virus (HAV). Most often spread by food and water contamination. Immune globulin —Preparation of antibodies that can be given before exposure for short-term protection against hepatitis A and for persons who have already been exposed to hepatitis A virus. Immune globulin must be given within two weeks after exposure to hepatitis A virus for maximum protection. See also Hepatitis B ; Vaccination . Arya, G., and W. F. Balistreri. "Pediatric liver disease in the United States: Epidemiology and impact." Journal of Gastroenterology & Hepatology 17, no. 5 (May 2002):521–25. Averhoff, F. et al. "Control of Hepatitis A Through Routine Vaccination of Children." Journal of the American Medical Association 286, no. 23 (December 2001): 2968–73. Ferreira, Cristina T. et al. "Immunogenicity and Safety of Hepatitis A Vaccine in Children with Chronic Liver Disease." Journal of Pediatric Gastroenterology & Nutrition 37, no. 3 (September 2003): 258–61. Jenson, Hal B. "The changing picture of hepatitis A in the United States." Current Opinion in Pediatrics 16, no. 1 (February 2004): 89–93. Murdoch, David L., et al. "Combined Hepatitis A and B Vaccines: A Review of Their Immunogenicity and Tolerability." Drugs 40, no. 5–6 (May-June 2004): 265–69. "What I need to know about Hepatitis A Homepage." NIHNDDIC . Available online at http://digestive.niddk.nih.gov/ddiseases/pubs/hepa_ez/ (accessed October 22, 2004).